I can’t believe it is finally here! Only a few more weeks (Publication date: June 27, 2017) before you can get your curious hands on this wonderful book. A middle-grade non-fiction filled with quirky and interesting facts about plants, animals, humans and more … but wait some of the stories are FAKE! And you the reader has to figure out fact from fiction by doing some research. It is a book to get the gears turning in kids’ minds. If you want to know more about the book, check out this wonderful review at Librarian’s Quest. Now on to the interview to learn a bit about how they worked on this book and details on the giveaway! 1) What was your inspiration or motivation to write this book? LAT: The idea for the book was initially Joan’s, but what really got me excited about it was Facebook. Right about the time we started working on the proposal, it felt like every day my Facebook feed was showing me some new, unbelievable story that had me wondering, Is that really true? I had to go research so many stories to verify–or dispel–them before I felt like I could share them or leave a comment. It was becoming impossible to ignore that this is the world we now live in. And, there was clearly an endless stream of material! 2) How did you divide up the work? AJP: We roughly go half and half across the board, and within that sphere we each choose our own stories. Sometimes there may be a bit of (virtual) arm wrestling involved when we’re both excited about one particular topic, but for the most part we each get very attached to stories we’ve stumbled across in our own research. I know I’ve always got a mental list of stories I’m dying to include in the next volume. It’s so hard to whittle down that list! LAT: Thankfully, it worked out perfectly. We make a great team! 3) What challenges did you face in working on this book? AJP: Some of the stories are more obscure than others, and for the lesser known ones it can be harder to find reliable research material—not to mention photographic evidence. Occasionally there is a story that would be amazing to include but for some reason isn’t possible. But for me, the biggest challenge is choosing which stories to include: Our current idea spreadsheet has over 450 listings! How are we supposed to narrow that down to just 27 stories per issue?! LAT: Agreed! Narrowing the stories down to just 27… AND then fitting them into the strict 3/3/3 structure. It’s like a jigsaw puzzle! (Which I’ll admit is one of the reasons I love doing these books, but it is definitely a huge challenge.) And, as Joan said earlier, we each have some favorite stories that we just have to include, so it takes quite a bit of juggling to make it all fit and make sense. 4) What was your favorite story to work on? AJP: Oh, that’s impossible for me to say! I had a ton of fun with just about every one of them, although I suppose I might be partial to a little guy named Mike. An upcoming tale of bees-gone-rogue in book #2 is a personal favorite. The book scorpions are pretty neat. Oh, and also the … sigh. Carry on! 5) How did you make the fake stories so darn believable? Embarrassed to say I did fall for them a few times. AJP: This was the goal – I do confess that we get a delicious thrill every time we hear that this is the case! The fact is that the true stories are so unbelievable that the fake ones blend right in and are very hard to spot. There are also some terrific hoaxes already floating around out there, which are fun to take hold of and tweak a bit for inclusion in the book. LAT: Hooray, mission accomplished! I think truth really is stranger than fiction, so we did have that on our side, as Joan said. Also, since many of our fake ones are based on existing hoaxes, they could sound familiar… Perhaps you read them on Facebook? That’s actually my greatest fear with these books, that people will remember that they read them but forget that they were actually false! 6) I understand this book is a part of a series. Can you tell us anything about the upcoming books? AJP: They are coming, and they will be awesome! This is the kind of book series for which it seems there is an endless source of material. That idea spreadsheet I mentioned? It grows every week. I’m so excited to have two more books on the horizon, and I’m crossing fingers that we’ll get the chance to do many, many more. LAT: Whereas the first book was about biology and life sciences, the second book will be all about social studies: history, geography, and culture. The third one… I’m going to keep that a secret for the time being. Ammi-Joan Paquette is the author of numerous books for young readers, including the Princess Juniper series, Nowhere Girl, Rules for Ghosting, and Two Truths and a Lie, co-written with Laurie Thompson. 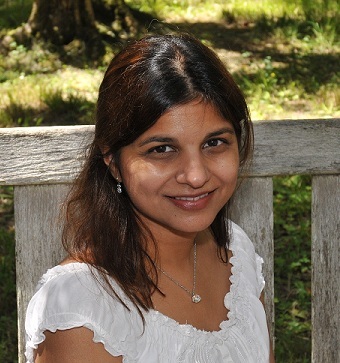 Her picture books include Bunny Bus, Ghost in the House, and The Tiptoe Guide to Tracking Fairies. Joan is the recipient of a PEN New England Discovery Award honor, and her books have been recognized with starred reviews and on a variety of “Best of the Year” lists. In her non-writing life, she is a senior literary agent with Erin Murphy Literary Agency. Visit her on the web at www.ajpaquette.com . A former software engineer, Laurie Ann Thompson writes for young people to help them better understand the world we live in and make it a better place for all. She strives to write nonfiction that encourages imagination and fiction the reflects universal truths, as see in Be a Changemaker, and inspiring how-to guide for teens; Emmanuel’s Dream, a picture book biography of a man who changed perceptions of disability; My Dog is The Best; and the upcoming Two Truths and a Lie series for middle-grade readers (co-authored with Ammi-Joan Paquette). Learn more at lauriethompson.com and on Twitter at @lauriethompson. For a chance to win this book, let us know two truths and a lie about yourself in the comments below. (here are mine: Jumped out of a plane. Danced for 24 hours straight. Gotten stranded on a Greek island for two days.) Deadline to enter is Monday, June 12th at 9pm PST. The contest is only open to residents of the U.S. and Canada. Father’s Day is coming up in a few weeks, and I’ve got two heartwarming books from Chronicle to share with you today. Animal daddies love keeping their babies beside them, even when they’re asleep! 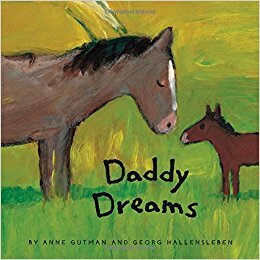 See how different animal dads sleep and dream, including a lion, turtle, bat, horse, and more, in this sweet celebration of a father’s love. No matter how Zs are caught, the daddy’s little one is never far away. 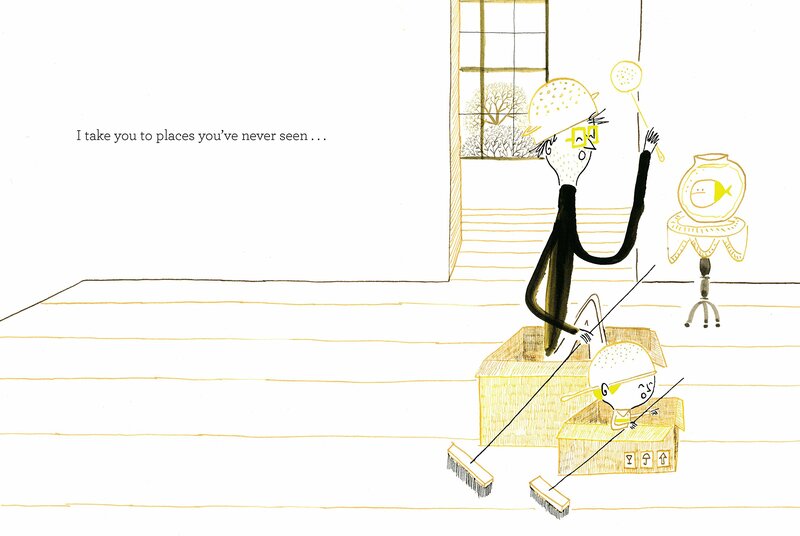 I enjoyed the colorful, rich illustrations that complement the simple text. Each heartwarming spread contains a daddy animal and it’s baby, building to the last page of a human father and child relaxing in the grass. The wonder of being a dad is on display in this touching tribute to fathers. After all, the connection between a father and child yields a lifetime of learning and love. 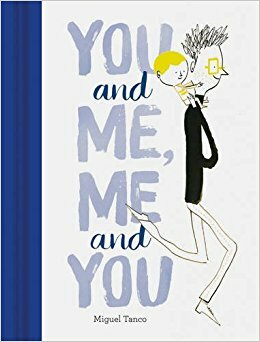 In You and Me, Me and You, that special bond is honored through poignant, tenderly rendered illustrated vignettes: a father and son walk together, discuss life amid a city’s bustle, play, and, perhaps most profoundly, grow, side by side. Bright pops of Pantone yellow infuse each spread with joy, and a cloth spine adds an irresistible specialness. At once a treasured Father’s Day gift and a year-round “I love you,” parents and children will delight in this celebration of a supremely meaningful relationship. I love this book. It beautifully captures those ordinary moments in a day that are turned special when experiencing it with a child. Adults may enjoy this book as it reminds them the joys of being present in the moment. Kids can connect with the little boy who is the ‘teacher’ in this story. The text is sparse at only 5-10 words per page, but it sets up the art for that perfect picture book magic. Disclosure: I received my copies of these book from the publisher. This review nevertheless reflects my own and honest opinion about the book. and the fox saw A CAT. Yes, they all saw the cat. Make your kids some cat eggs and read this book while they eat! I made these eggs using FUNNY SIDE Up cat egg mold. A gorgeous thoughtful book sure to become a modern classic. I love the dichotomy of taking simple picture book text paired with colorful child-appealing art to talk about a big, abstract, philosophical idea. Pure Genius! The book follows a cat as he walks through the world and the reader gets to see how each of the other animals – a fox, dog, rat, fish – view the cat. What I find amazing about this book is that the big idea is not addressed anywhere in the text. It only exists in the reader’s mind as he/she is reading the text and looking at the pictures. It is something to be realized and felt inside. A variety of materials were used to make the art: colored pencils, oil pastels, acrylics, watercolor, and more. The author used different styles to help show each animal’s unique perspective of the cat. This is an important book, one that I hope will find its way onto every bookshelf. He knows he is a duck because he lives at the duck pond with all the other ducks. Quackers is a duck. Sure, he may have paws and whiskers. And his quacks might sound more like…well, meows, but he lives among ducks, everyone he knows is a duck, and he’s happy. Then Quackers meets another duck who looks like him (& talks like him, too! )—but he calls himself a cat. So silly! Quackers loves being among his new friends the cats, but he also misses his duck friends, and so he finds a way to combine the best of both worlds. Part cat, part duck, all Quackers! Opening page – juxtaposition of a cat saying “meow” with the text reading “Quackers is a duck.” You know it’s going to be a good story right from the beginning because that question WHY has popped up along with a billion other questions which the author skillfully navigates. Theme – finding your place and that it doesn’t have to be with just Group A or Group B but can be something in-between of your own choosing. Art – so adorable and simple. Lovely and perfect for young kids. I love the shades of green with muted red barn and blue-green water. The white ducks and orange cat just POP in this spread. This spread packs an emotional punch of what it’s like to feel different. Grab a kid and read this book together at home or use it for story time in a classroom. Disclosure: I received an F&G of this book from the publisher. This review nevertheless reflects my own and honest opinion about the book. I am thrilled to bring you today’s book review. I first ‘met’ Julie Falatko over the Internet back in 2012. She had just started doing book reviews on the Brain Burps podcast when I recommended Mathew Cordell’s ANOTHER BROTHER to her, hoping she would love it. I am so excited to see her witty, quirky humor getting out into the world. 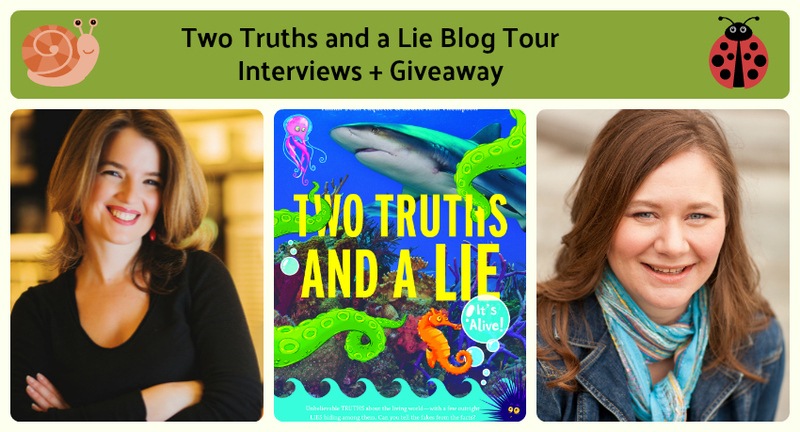 My fun-filled interview with Julie Falatko and Snappsy. Snappsy the alligator wasn’t feeling like himself. His tail wouldn’t swish this way and that. And, worst of all, his big jaw wouldn’t SNAP. Snappsy the alligator is having a normal day when a pesky narrator steps in to spice up the story. Is Snappsy reading a book … or is he making CRAFTY plans? Is Snappsy on his way to the grocery store … or is he PROWLING the forest for defenseless birds and fuzzy bunnies? Is Snappsy innocently shopping for a party … or is he OBSESSED with snack foods that start with the letter P? What’s the truth? Printable activity sheets – coloring, maze, bookmark, and more! A fusion of meta-fiction and unreliable narrator with a dose of heart. A book that can be simply enjoyed for the witty humor or dissected in classroms for its clever storytelling. Right away from the book cover you know something is awry with the first part of the title in bold maroon letters, and the second part in a Snappsy dialogue bubble. This is the basic jist of the story, overbearing narrator vs humble Snappsy. I love the interplay between what the narrator says about Snappsy versus what Snappsy is actually doing – Snappsy hunting for animals to eat (false) vs Snappsy on his way to the grocery store (truth). I think Kirkus Review said it best by likening the narrator to Rita Skeeter. No wonder Snappsy is snappy. But he does humor the narrator by throwing a party to spice up the book. The reveal of the narrator was an unexpected pleasant surprise. I love the narrator’s authoritative voice. (Come back tomorrow to find out the author’s influences on this.) I also really enjoyed Snappy’s dialogue when retorting back. Who actually says “You are really cheesing me off.” So original. It is sophisticated storytelling to pull-off essentially two characterizations of a single character, and in a picture book format. Ms. Falatko provided the skeleton and framework which Mr. Miller filled out with his unique artistic vision. A perfect marriage of text and art. The retro-cartoony art are simple drawings but full of charm and depth. I loved all the little tidbits that the illustrator added to Snappsy’s character such as the tie and fez. I also enjoyed the interpretive license. Text says “forest” but the art shows a bamboo forest. Snappsy visits a grocery store but it’s actually and ABC Grocery store where the aisles are letters not numbers. The art enrichs the story taking it to another level. This is a fun read and one I can see kids going back too for more. For a special Snappsy treat take of the dust jacket. Check-out this awesome book trailer. Enjoy!